Kehlani performs in this 2015 file image. Bay Area singer Kehlani survived an alleged suicide attempt Monday as rumors swirled about her cheating on her boyfriend Kyrie Irving. TMZ reported that the 20-year-old R&B singer was placed on a psychiatric hold after emergency responders at her Hollywood Hills residence said she was a danger to herself. 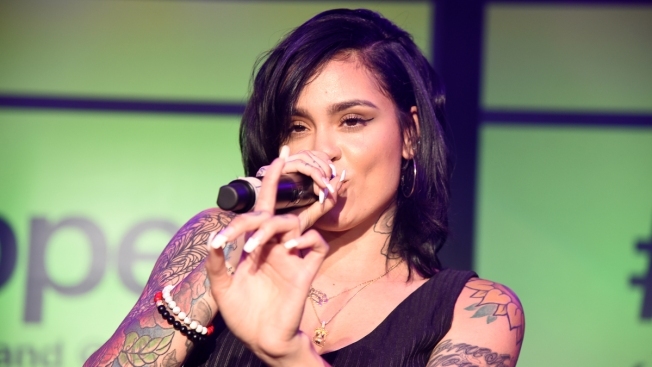 Law enforcement officials told TMZ that Kehlani – born in Oakland as Kehlani Parrish – was taken to a Los Angeles hospital for mental evaluation. Before being signed to Atlantic Records and earning worldwide fandom, Kehlani worked at Park Burger in the East Bay — one of the few places that was willing to hire her, tattoos and all, she said. Her album "You should Be Here" was nominated for Best Urban Contemporary Album at the 2016 Grammy Awards. While in the hospital, Kehlani posted a picture on Instagram that depicted an IV in her tattooed arm. "I wanted to leave this earth. Being completely selfish for once. Never thought I'd get to such a low point." She did, however, express appreciation for being alive. "God saved me for a reason, and for that … I must be grateful. Coz I’m not in heaven right now for a reason," Kehlani said. Kehlani has denied allegations of being unfaithful to the Cleveland Cavaliers’ point guard with her ex-boyfriend Jahron Anthony Brathwaite, who is known under the stage name PartyNextDoor. "Don’t believe the blogs you read. No one was cheated on and I’m not a bad person. Everyone is hurt and everyone is in a place of misunderstanding," she wrote. Kehlani, who has 2 million followers on Instagram has since deleted that particular image and every other one she had posted. There is no information on Kehlani’s current condition or how long she will be hospitalized, but people close to her have told TMZ that she is improving. On Tuesday night, singer Chris Brown mocked Kehlani's suicide attempt on Twitter, calling it a PR stunt to gain sympathy, TMZ reported. "There is no attempting suicide. Stop flexing for the gram. Doing sh*t for sympathy so them comments under your pics don't look so bad," Brown tweeted.